I don't know who first came up with it but it's a marvellous saying. Sometimes you're the windshield, sometimes you're the bug. It's like sometimes you win, sometimes you lose...but far more descriptive. I mean have you ever had it happen to you? You're driving along as the sun's just gone down. You turn on your lights in the dusk and the bugs just seem to flock to your windshield, drawn as if by a magnet. Now, of course, you're faced with a choice. 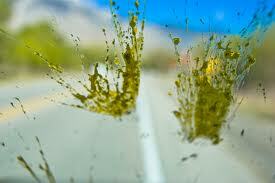 Do you just leave them be or do you flip on the windshield wipers and shoot windshield wiper fluid at your windshield. If it's ever happened to you, you know this is a no-win situation. Trying to clean them off usually makes it worse. You better hope you find a gas station...or a guy at the side of the road who wants a dollar...with a squeegee. That's the only way. And, of course, the bug never wins. It's always the windshield that comes out on top. When I was a kid, though, riding my bike on paths through nearby fields, the bugs won...in a suicidal fashion. Of course I had no windshield on my bike. And as I pedalled faster and faster I'd open my mouth wide to catch my breath and, alas, that wasn't all I caught. Yep, I swallowed a bug or two in my time. Quite a few, actually. And people wondered why I looked bug-eyed half the time. Sometimes you're the windshield, sometimes you're the bug has a sense of finality, doesn't it? I mean sometimes you're the screen door, sometimes you're the bug doesn't carry with it the same sense of doom and meeting your maker. And sometimes you're the window, sometime you're the bug doesn't work because there's a 50/50 chance the window'll be open. And it's oh so true. It happens all the time in life. You know, dufus, I feel like I'm the bug a lot more often than I'm the windshield..
Last week I hit that humongous windshield of life when I finally realized I am not, in fact, invincible. It's a bit of a relief to get that one out of the way. It's all sideways from here. With me it's age. My body just can't keep up with what my head dreams up. Sigh. What? You think it isn't age-related with me too? After 50 it's just pieces and parts and apparently, windshields flying around waiting to smack us upside the head. I was trying to be polite. Watch out for those windshields. They hurt. You seriously crack me up, John. Also, great tune! My work here is done, then.